Built for speed, Cheetah is one of the most fascinating of all animals. A design in the epitome of pace, Cheetah outruns everything on the plains of Africa, establishing itself as one of the most successful hunters in family felidae. Although not included in big cats by many experts owing to its inability to roar, Cheetah is one of the most envied big game predators in the wild, arousing frequent backlash by lions and leopards who often find themselves unable to compete with Cheetah's hunting prowess. Honed to a sleek and slender physique Cheetah ranges in weight from 100 to 150 lbs, with its long body and tail assisting it in high speed pursuits. The coat is generally yellowish with small black spots running throughout its length. The belly, like most cats, is whitish. Evolutionary adaptations that enable Cheetah to generate tremendous speed include large nostrils, heart and lungs (that enable maximum oxygenation during rapid pursuits), big adrenal glands (for the adrenaline rush! ), rudder-like tail (for balancing and rapidly turning to match the clever Thomson gazelle) and non-retractable claws (to provide 'grip' on the ground during the chase). Cheetah's speed means that it can take down prey that most predators don't even think about - the Springbok is magnificent in its own right and yet can't evades the Cheetah half the times. Impala and hares are also frequently preyed upon, whereas wildebeests are taken down only in pairs. Usual approach is to stalk the prey and approach as near as possible. When it is near to being spotted, Cheetah begins the chase - reaching from 0 to 100 km/hr in three seconds, Cheetah outclasses most modern automobiles - capable of reaching 125 km/hr with its feet almost seeming not to touch the ground! After bringing the prey animal down, powerful jaw muscles enable Cheetah to crush the victim's wind pipe while the large nostrils allow it to breathe simultaneously enabling it to hold on for long periods. The high speeds tire this great hunter also, elevating body temperature to dangerous levels. The cat thus rests after the hunt, making it vulnerable to scavengers like hyenas who often claim the kill. Cheetah has an organized social structure, with males forming coalitions and female doing solitary hunting and parenting. A big litter is born after mating that continues year round, though a fraction of the cubs survive, and are often killed by lions, leopards and hyenas. Maturity is reached at one year for males and two years for females, after which time they leave the mother to establish their territories, with the ranges varying with habitat. 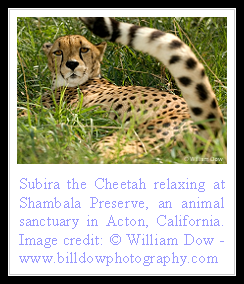 Cheetahs prefer relatively open grasslands and are not very adaptable to changes in their environment. Limited degree of adaptability, inbreeding, hunting by farmers and poachers and removal of animals from the wild for use as pets - through history - have meant that Cheetah lacks genetic biodiversity as a species to an alarming extent, with some experts fearing its survival. The splendid cat is considered threatened in Asia and vulnerable in Africa, with foundations in Africa working to restore their ecosystem in the wild and overcoming the shortage of prey and habitat that are threatening the flourishing of this fantastic animal. that cheetah is some cat! sometimes mama says i have cheetah spots on my sides. when i was young, i could run like the wind! i was so flexible i could go anywhere and do anything. now that i'm not, i look at pictures like these and remember. I sure do wish I could run fast as a cheetah! That would be amazing, to be able to run that fast. I am built much more for comfort than for speed. Thank you for a fascinating post! Cheetahs are fascinating cats. Aren't they the only ones with non-retractable claws? I love to watch them run on the wildlife videos. never mind the speed daisy. remember u can climb where cheetah can't. u're welcome monreow. u sure r built for the snooze. 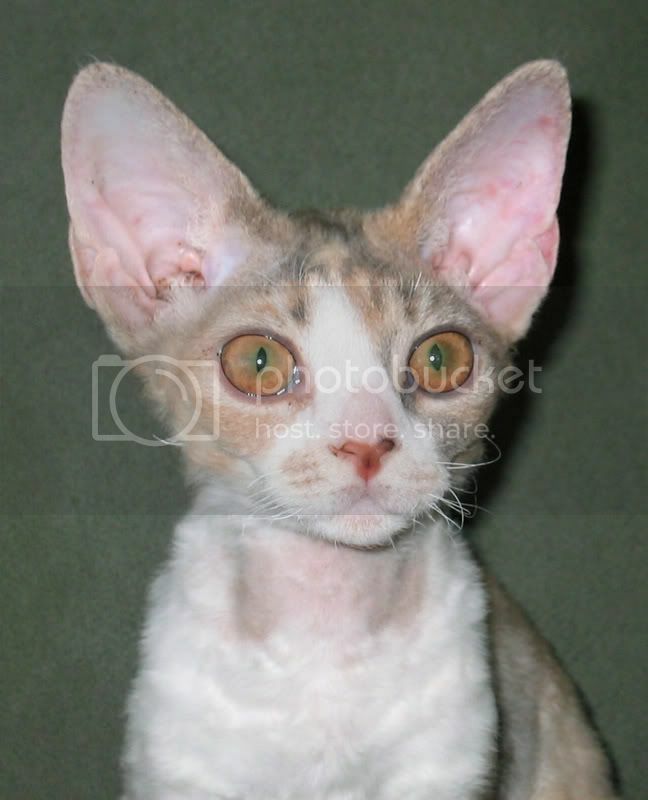 karen there are few other cats with semiretractable claws - the fishing cat, iriomote cat and flat-headed cat! I cant beleive they were tortrued now I know why they have black lines like tears. Pretty kitty. I love the kitty. It's so cute. Such a pretty kitty. I could eat it all up is's so pretty. i love cheetahs especially their cubs boy! thier cuuuute! 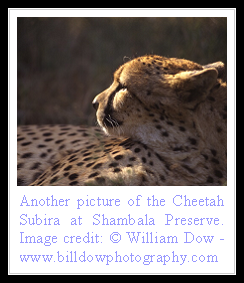 About the weight of cheetahs... although the most often cited average weight is 40-65kg, studies conducted by T.M. Caro in the Serengeti and L. Marker in Namibia showed that the average weight is 35.9kg(N=19) for females and 41.4kg (N=23) for males in the Serengeti, while in Namibia it is 37.2kg (N=38) for females and 45.6kg (N=99) for males. The weight range is 21-60kg. Cheetahs are amazing creatures aren't they? Cheetahs average weight 41-54 kg. T6his website is extremely unreliable. Lions and leopards kill cheetahs because of the hunting competition but not out of spite or jealousy. They do not envy the cheetah. The cheetah is the weakest and most vulnerable apex pre in africa. The only way to get reliable information is by reading books by biologists who have conducted their own studies. When I was young I ran as a Cheetah, now that I'm older I run as a Lion. Do you understand ?? sorry but a leopard ( male) can weight 200 lbs ( 90 kg ) , but it says its highest weight is 140lbs , dont get me wrong i love this sight but really , a male cheetah is heavier than a male leopard no ! Cheetahs are NOT as vulnerable as people think.....lions and leopards can not survive on flat out land like cheetahs do!!!! Plus cheetahs fur is so so so so much more beautiful than lions fur and I. Personally think cheetahs are way braver than lions are because cheetahs are weaker than lions they are still willing to live side by side with them... Not tryin to dis on lions but cheetahs DON'T scavenge like lions do so at least I know that cheetahs are more capable of catching prey than lions especially in the dry season.... I looooooovvvvvveeeee cheetahs. I am going to work with them as a job and save the species from ultimate extinction.